A MOTHER OF of three said that she was meant to escape and meant to live when recalling the terrifying ordeal when she was held against her will at knife-point by her ex-partner. At Ennis Circuit Court, Jennifer Haugh (42) made her comments during her victim impact statement over her false imprisonment by her ex-partner, Gerard Garvey at a unit of Kilkee industrial estate last August. 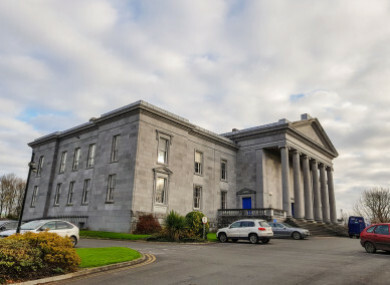 Garvey (49) of Marian Estate, Kilkee has also pleaded guilty to the assault causing harm of his partner of 28 years and the mother of their three children. Haugh told gardaí that during the incident at Unit One at Kilkee industrial estate on 20 August last that Garvey told her to shut up or he would stick the knife into her and slit her throat. Haugh said that Garvey then tied her hands with orange rope and pulled her along the ground. Haugh told gardaí that Garvey continued to threaten her that he was gong to kill her “and that he wasn’t going to leave her alive today”. Flaherty said that Garvey gave chase and caught Haugh and then banged her head off the ground a number of times and pulled her along the ground to the passenger side of a car. Haugh’s screams alerted a woman nearby and Samantha Fennell arrived at the scene. Fennell said that Mr Garvey told her to go away and that “everything was okay”. She said that Garvey said that he was only trying to talk to Haugh. Fennell said as Garvey got into the driver’s seat, Haugh got out the passenger door and ran towards Fennell’s car. The two then travelled to Kilkee Garda Station where they raised the alarm. Gardaí went to the unit and Garvey had already fled. Gardaí then issued a ‘missing persons’ alert for Garvey due to family and garda concerns for his own safety. Gardai arrested the man two days later in the grounds of Ennis General and during his three interviews with gardaí, Garvey maintained his right to silence. Flaherty said that Garvey and Haugh had also operated a shop together and said that Garvey had no previous convictions over the preceding 20 years. In her victim impact statement, Haugh said that she isn’t the same person since Gerard Garvey imprisoned her. Counsel for Garvey, Patrick Whyms, told the court that the background to the incident is a domestic situation. Whyms said his client started to suffer from depression from March 2018 and had stopped taking his medication five weeks prior to the incident in Kilkee. Whyms said Mr Garvey, in his own mind, did not wish to hurt Haugh and but instead wanted to talk about the breakdown of the relationship and issues relating to the division of assets. He said his client denies threatening to kill Haugh but has pleaded guilty to false imprisonment, the most serious charge and assault causing harm. Whyms said this was an “awful thing” for Ms Haugh to go through and asked the court to accept it was completely “out of character” for Garvey. Whyms submitted it was a “one off” incident and asked the court to consider suspending a portion of any sentence. Judge Gerald Keys further remanded Garvey in custody and adjourned the case to 20 May. Email “'Traumatised forever': Mother of three recalls false imprisonment at knife-point by ex-partner ”. Feedback on “'Traumatised forever': Mother of three recalls false imprisonment at knife-point by ex-partner ”.